More than 110 miles of track will connect 85 stations over six lines. The cars can reach speeds up to 90 mph, and Zaha Hadid Architects designed one of the train depots. For several American cities, the infrastructure for their public transit systems have been in place for more than a century. It’s almost like Chicago, New York City, and Boston laid down train tracks the day after they were founded. Riyadh, the capital of Saudi Arabia and the home to 6 million people, is building its first light rail system from scratch. Tech Insider reports that the city is building six metro lines that connect 85 stations over nearly 110 miles of track. Also, a new bus system will be implemented. For $10 billion, the Saudi government hired the U.S. construction and civil engineering firm Bechtel to lead the project. Bechtel assembled a group of contractor firms, and they are using 1,000-ton boring machines to hollow out train tunnels underneath the city for nearly 40 miles of track for 39 stations. A few major architects have even designed train stations. 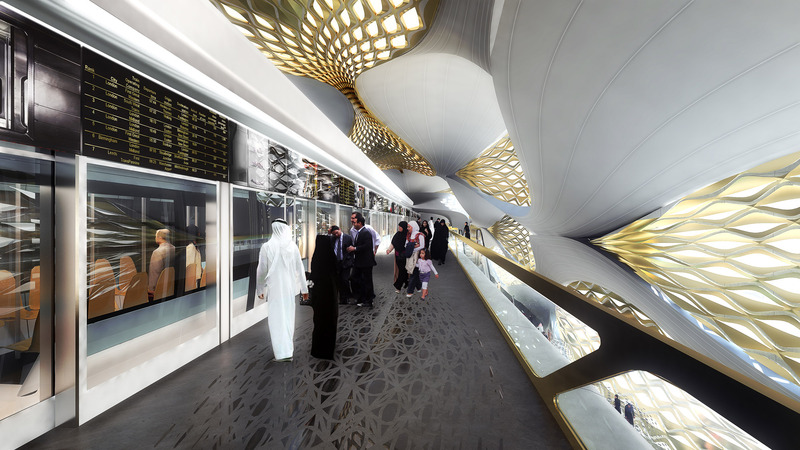 Zaha Hadid Architects, for instance, designed the King Abdullah Financial District Metro Station, which will connect Lines 1, 4, and 6. The building will have a wavy lattice exterior and will contain four public levels and two underground levels of parking. The trains themselves will be nicer than any American rapid transit vehicle. The trains will be automatic, driverless, fully air conditioned, and Wi-Fi accessible. They can run up to 90 mph. Around 20% of the system’s power will come from solar energy. The new transit system is expected to be ready by the end of 2018. Public transit will come just in time for the growing city, as estimates say that Riyadh’s population could reach 9 million by 2035. Exterior of the King Abdullah Financial District Metro Station. Rendering courtesy Zaha Hadid Architects. Click to enlarge.